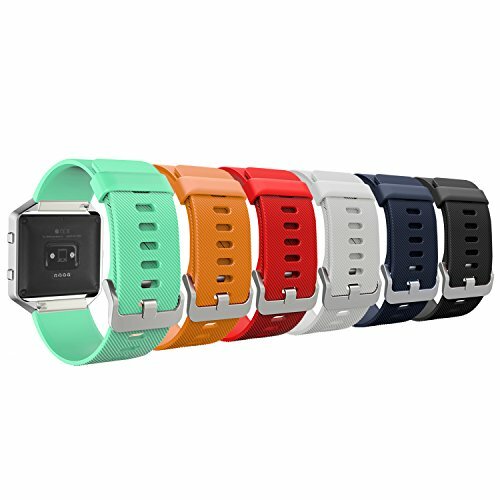 Custom designed for your precious Fitbit Blaze Smart Fitness Watch, this MoKo Fitbit Watch Band features a combination of functionality and style. * Personalized Your Fitbit Blaze Smart Fitness Watch with this refined replacement wrist band. Smart Watch NOT included! * Band comes with Fitbit Blaze Watch Lugs on both ends, which locks onto Fitbit Blaze Watch Band Interface precisely and securely. * The quick release pins make the band easy to install and remove. Stainless steel buckle clasp for closure. * Delighted varied color fits your mood and outfits in daily life. Not only sport watch bands but also fashionable accessories. * 6 colors included: Black, White, Red, Midnight blue, Mint green and Orange. * Soft food grade silicone with smooth finish for a sporty look. Comfortable and durable. Come with 2 additional spring pins for future use. * Fits 5.90"-8.26" (150mm-210mm) wrist. Soft food grade silicone with smooth finish for a sporty look. Comfortable and durable. Fits 5.90"-8.26" (150mm-210mm) wrist. Personalized Your Fitbit Blaze Smart Fitness Watch with this refined replacement wrist band. Smart Watch NOT included! Band comes with Fitbit Blaze Watch Lugs on both ends, which locks onto Fitbit Blaze Watch Band Interface precisely and securely. The quick release pins make the band easy to install and remove. Stainless steel buckle clasp for closure. Delighted varied color fits your mood and outfits in daily life. Not only sport watch bands but also fashionable accessories.